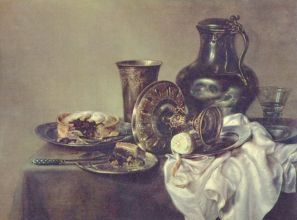 Willem Claeszoon Heda (December 14, 1594, Haarlem - c. 1680, Haarlem) was one of the earliest Dutch artists devoted exclusively to the painting of still life. He was a contemporary and comrade of Dirck Hals, akin to him in pictorial touch and technical execution. 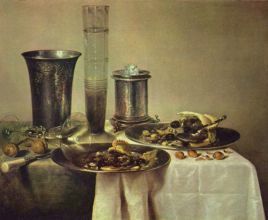 But Heda was more careful and finished than Hals, showing considerable skill and taste in the arrangement and colouring of his chased cups, beakers and tankards of both precious and inferior metals. 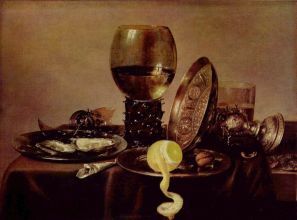 Nothing is so appetizing as his fare: delicacies such as oysters upon rich plate, and seldom without cut lemon, bread, champagne, olives and pastry. 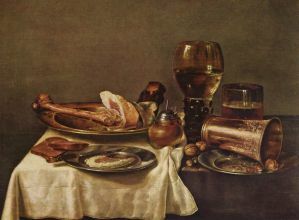 Even the more commonplace meals have charm, comprising sliced ham, bread, walnuts and beer. 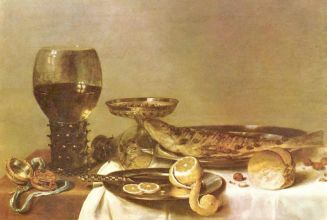 One of Heda's early masterpieces, dated 1623 and in Alte Pinakothek, Munich, is as homely as a later one of 1651 in the Liechtenstein Gallery at Vienna. 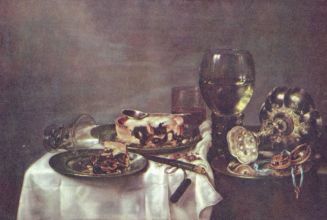 A more luxurious repast is a "Luncheon" in the Augsburg Gallery, dated 1644. Most of Heda's pictures are on the European continent, notably in the galleries of Paris, Parma, Ghent, Darmstadt, Gotha, Munich and Vienna. He was a man of repute in his native city, filling all the offices of dignity and trust in the guild of Haarlem. He seems to have influenced considerably the young Frans Hals.